SCV Camp #227, The Jones County Rosin Heels received the Dunbar Rowland Scrapbook Award for 2013. SCV Camp #227, The Jones County Rosin Heels received the A. J. Frantz Media Award for 2012 which is to be presented to the Review of Jones County for their coverage of the Rosin Heels's events throughout the year. 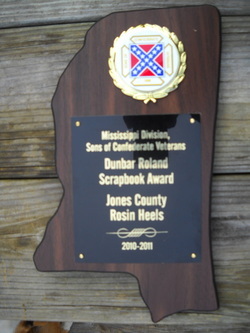 SCV Camp #227, The Jones County Rosin Heels received the Dunbar Rowland Scrapbook Award for 2011. 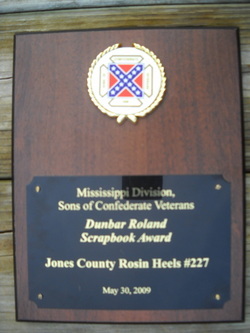 SCV Camp #227, The Jones County Rosin Heels received the Dunbar Rowland Scrapbook Award for 2009.